Norwegian Foreign Minister Børge Brende is a busy man again this week, now on his own home turf instead of on his constant worldwide travels. 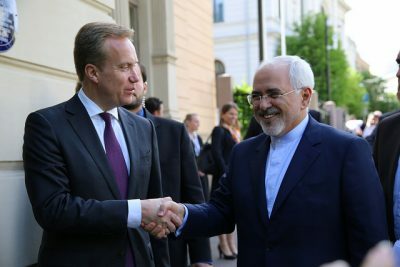 Brende is hosting peace brokers and several key leaders including his counterpart from Iran, at the 15th annual Oslo Forum. The forum, which has been billed as a means of improving the mediation of armed conflict, is once again being held at an historic estate just northeast of Oslo, Losby gods. It features a hotel and golf course but can also be a secure site with strictly controlled access. 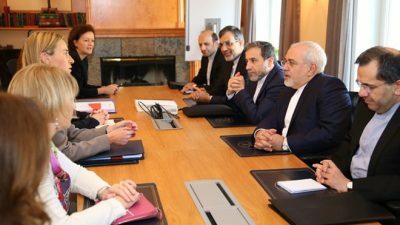 Oslo Forum participants including Federica Mogherini, the EU’s “High Representative for Foreign Affairs and Security Policy,” and Mohammad Javad Zarif, foreign minister of Iran, can meet and mingle in a place that’s private as well as scenic. The venue, boasts Norway’s foreign ministry, has become known as a prime meeting place for those engaged in facilitating and carrying out peace processes and conflict resolution. In addition to dignitaries like former US Secretary of State John Kerry, the foreign minister of Colombia and leader of Colombia’s FARC guerrillas (both of whom are still in the midst of a landmark peace process in which Norway participated for years), the forum has attracted around 100 researchers, peace brokers and politicians with experience from various peace processes. The foreign ministers of Jordan, Oman, Bosnia-Hercegovina, Sudan, Slovakia, Indonesia, Kenya, Somalia and Finland are attending, along with the deputy prime minister of Croatia. This year’s theme is “Peacemaking in a New Era of Geopolitics.” Brende noted that “geopolitical positioning” and rivalries over power and influence across borders have become “clear drivers of conflict,” making it necessary “to discuss and think in new ways about how the international community can succeed in preventing and resolving conflicts.” He called the upcoming meeting with Colombian Foreign Minister Maria Angela Holguin and FARC leader Rodrigo Londono (aka Timoleon Jimenez) a “unique opportunity” to learn from the Colombian process that won last year’s Nobel Peace Prize. Their panel discussion on Wednesday is entitled “Colombia: Putting Peace into practice,” and it’s the FARC leader’s first foreign trip since the peace pact was signed late last year. Other current issues were also on the agenda if not on the formal program. The US’ former top foreign policy official, John Kerry, touched on international climate concerns, for example, after a bilateral meeting with Brende on Monday. He claimed that a majority of Americans still support the goals struck at the UN’s climate conference in Paris. Even though new US President Donald Trump upset many around the world when he declared he’d decided to withdraw the US from the Paris Agreement, Kerry noted that can’t happen for another three years, and 2020 will be another presidential election year. “A new president can choose to get the US back in again,” said Kerry, a veteran diplomat and politician and former presidential candidate himself who now works for the think tank Carnegie. The EU’s Mogherini, meanwhile, was making time during her trip to Oslo this week to visit the island of Utøya, where 69 mostly young people were killed and scores others wounded by a lone right-wing extremist. She wants to honour those killed in what’s alternately been called a terrorist attack and a mass murder, at a time when terrorism continues to grip Europe and much of the rest of the world. The Oslo Forum to promote peace is taking place 50 years after the six-day war in the Middle East that left Israel occupying Palestinian areas, and at a time when any peace pact between the Israelis and Palestinians “seems more distant than ever,” wrote news bureau NTB this week. The leader of Norway’s Socialist Left party (SV), Audun Lybakken, has called for an evaluation of Norway’s diplomatic efforts over the years, the billions of kroner Norway has spent on aid to the Middle East and how Norway can pressure Israel into giving up its occupation and contribute to a peace pact. Lysbakken has so far failed, however, to win support for his proposal in the Norwegian Parliament, while Brende and his colleagues keep asserting their diplomatic efforts.